Comprised of equipment lists, drug lists, record-keeping lists, license requirements and permit requirements from several states, InspectionPass helps you avoid fines and risks to your license. The highest and most comprehensive standards of care from a variety of states are included in this product: you name it—InspectionPass has it. InspectionPass is not just for sedation inspections, either. It covers everything—even the small, missing items that are less noticeable but can still get you into trouble. Perhaps most importantly, InspectionPass allows you to go above and beyond the standard of care. Passing an inspection is important, but creating an environment in which your patients can enjoy a safe, comfortable dental visit-whether sedated or not-is the most valuable thing you can offer as a clinician. In this respect, InspectionPass is invaluable. InspectionPass is set up as a series of easy-to-use checklists that allow you to quickly determine both what you have and what you need. There are BLS, ACLS and pediatric versions—all intricately tailored to your specific needs. Even if you pass your inspection, it is important to continue practicing regular drills in your office. Twice a year is standard. Your malpractice carrier will appreciate this. Because every dental board bureaucracy is different, DOCS Education cannot guarantee you will pass your inspection. 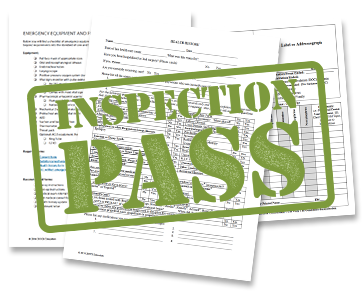 InspectionPass will give you the best chance possible. We have 'been there and done that' and we know what works.